Early season Campylomma feeding damage on apple. Pest description and crop damage Campylomma is Asian or European in origin. Adults are brownish-yellow and about 0.1 inch long, very mobile and active. Nymphs are small, green, and fast moving and about 0.1 inch long when mature. The mature nymphs resemble aphids in some ways but are far more active. 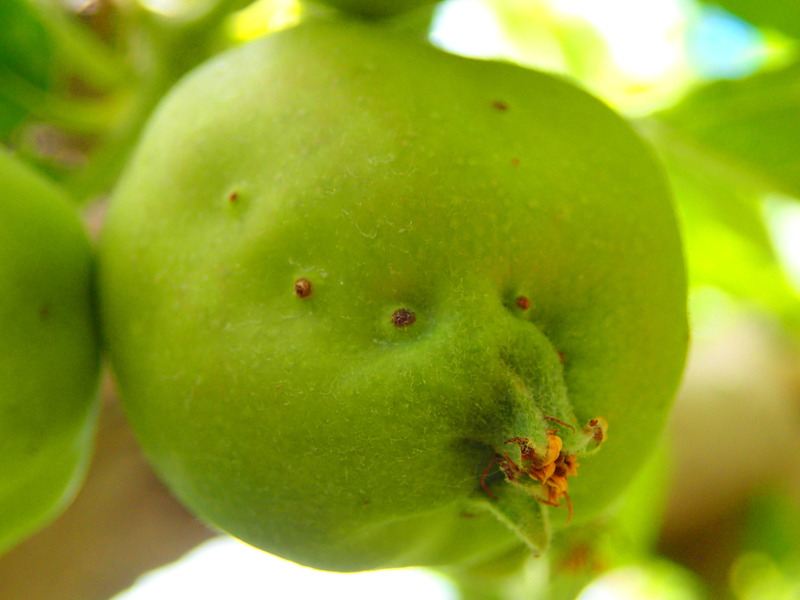 Feeding by nymphs causes dimpling and distortion of fruit. Biology and life history Campylomma females lay their overwintering eggs into crevices in the bark of the tree where the eggs lie dormant until spring. 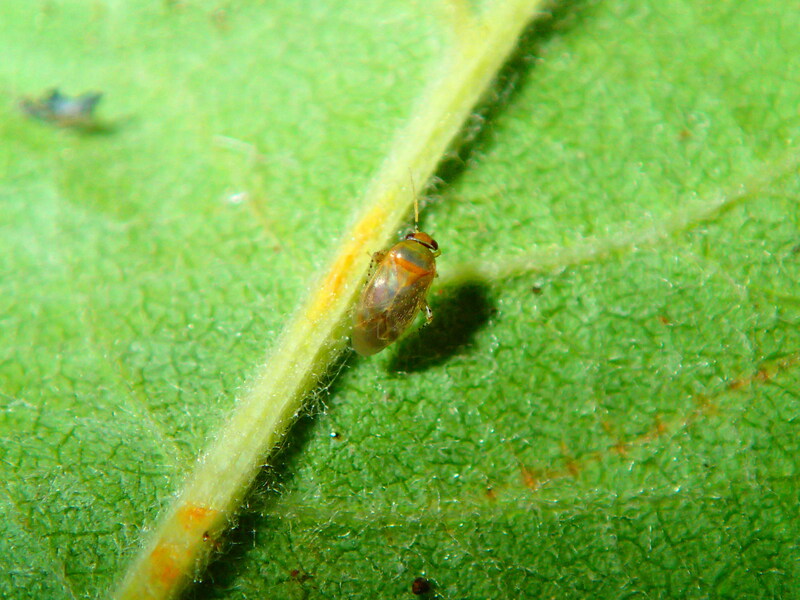 The eggs begin to hatch prior to bloom and developing nymphs can scar fruit with early feeding activity on the tiny maturing fruitlets. Campylomma remain on the tree host through the bloom period until late spring when they move to herbaceous host plants. Campylomma is also known as mullein plant bug, after one of its preferred herbaceous hosts - the noxious weed common muellein. Weeds and crop plants such as potato, sugar beet, corn and small grains are also accepted herbaceous hosts. Campylomma feeds on the plant as well as preying on aphids and thrips while on the herbaceous host. Later in the season, adults move into to the orchard to mate and lay eggs. Other than the brief window around bloom when fruit damage can occur, campylomma is overwhelmingly a beneficial insect that helps manage aphids, mites, and psylla in the orchard. Monitoring populations early in the season is important for determining whether to apply treatments which are typically timed at prebloom or bloom (take precautions to protect pollinators). After this period, campylomma cannot damage fruit and acts as a beneficial insect. Operators may find that it is cost-effective to hand thin the fruit that is damaged in the early season. Scouting and thresholds Nymphs and adults may be monitored by limb tapping from the pink stage through petal fall. Early-blooming apple varieties may be most affected. Damaged fruit can be thinned. There are no products specifically registered for control of campylomma in apple.